ZEGG Forum is a compassion building and transparency circle that forms the heart of New Culture camps. Practiced daily at camp, Forum encourages community members to share what’s alive in the moment. In Forum, each individual’s experience can be seen and understood, leading to greater empathy and connection in the community. One of the gifts of Forum is that it allows us a space to appreciate every perspective without taking it on as “truth.” Every voice has its own poignancy, its own wisdom, its own truth, that does not negate the wisdom and truth of other perspectives. Allowing all voices to surface and be known can lead to a profound and unexpected integration within a community. We tend to think that events leading to painful experiences and conflicts are bad, because they feel bad in the moment. However, when we open ourselves and compassionately witness what is happening for everyone, these experiences can be gateways to greater closeness, understanding, and love. When conflict emerges, whether or not we are in a formal Forum space, we can choose to listen in this way. This deep listening sustains and nurtures community life and relationships. 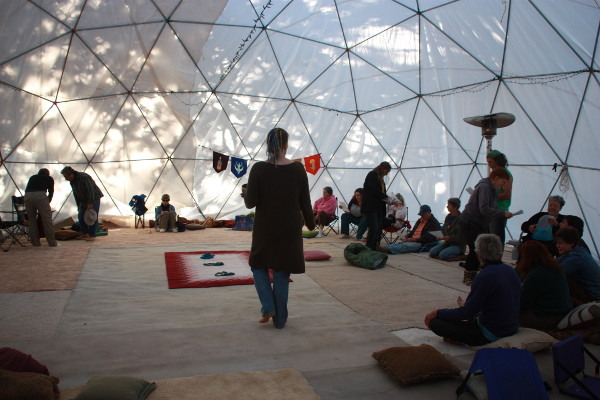 Forum is a social technology that was created at ZEGG (an intentional community in Germany) and its sister community Tamera, as a way of promoting transparency and mutual understanding among community members. Our trained and experience Forum Facilitators are not therapists, and are not here to “fix” anything. Our purpose to to help you get to the heart of what you wish to bring to the community and to hold the space as a loving container for whatever you wish to bring.